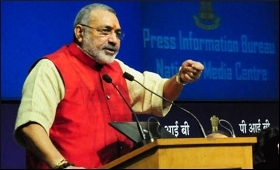 MSME Minister Giriraj Singh on Tuesday urged the banking sector to play a stronger role to push financial inclusion of Micro Small and Medium Enterprises (MSMEs) of the country. In his inaugural address at a Regional Conference on MSME Financing under National SC/ST Hub Scheme in New Delhi, Singh, while appreciating the banking sectors concerns about the Non-Performing Assets and bad debts, pointed out that where there is need based financing from the banks the recoveries have been more than 99 per cent. He urged the banks to set their priorities in line with the policies and financial guarantees of the Government and provide loans to youth and small entrepreneurs. The MSME Minister said Government is keen to bring SC/ST entrepreneurs at par with their counterparts in the industry, dedicating financial schemes exclusively for them. Talking about the 12 initiatives of the Government for the MSME sector announced by the Prime Minister on 2nd November 2108, Giriraj Singh urged MSMEs to take full advantage of the 59 Minute Loan Sanction portal. He said the resources are limited but the Government, during last 4 years, have done a lot for the development of MSME sector.